At a loss for where to place a potted plant close to a window so that it get some sunlight? Simply out of floor or table space, but still desiring the natural look of a lush plant? Consider a macrame to support potted plants inside your home almost anywhere. These fabric plant hangers wrap around your potted plant and support them from underneath. They make a hanging basket out of any potted plant and they open up more options for you at this time of the year when you might be struggling to locate that perfect spot to place a potted plant that has been outdoors all summer long. 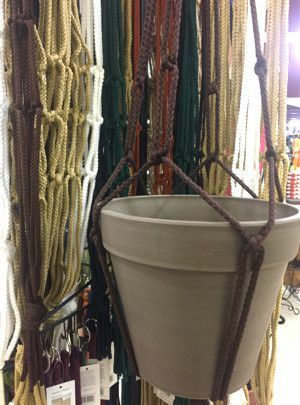 Macrames are made in many different shapes, sizes, and colors, so we encourage you to stop by our large display of macrames in our Garden Department. When using a macrame, we recommend that you switch out the pot to one with NO drainage holes (if this is not already the case). The result is a planter that you can water regularly without the worry of making a mess of the surfaces below.